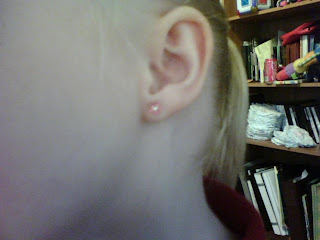 Blair Family Blog: Carlie and Maci got thier ears pierced. Carlie and Maci got thier ears pierced. Carlie and her earrings. Its a flower with a diamond. I bet they were so excited! I asked Phill the other day when we should do Hannah's. We still haven't come up with a good time! I'm sure it'll be a totally spare of the moment thing. Well anyways... it looks cute! Ronni what is up? I am so glad that we have blog's now and by the way your's is darling. Isn't Allie good? Yah how funy was pinkus huh? I couldn't stop laughing when I typed that... It was hillarious!!! We got our fish tank setup!